Advantages: Good format for modellers; compact history; ample wartime photos; excellent modelling; attractive profiles; bi-lingual text. Recommendation: Recommended to anybody planning to build the Classic Airframes RE 2000 Falco. 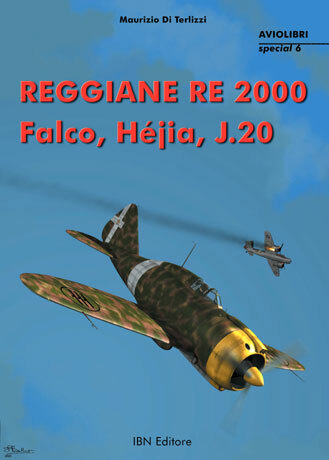 The latest book in the Aviolibri series is "Reggiane RE 2000" by Maurizio Di Terlizzi. This is the 6th title in Aviolibri's Special Series and Maurizio's tenth title. The book commences with 25 pages of concise history and wartime images of the Falco in service. Good coverage is also given to the Hungarian operated Heja and the Swedish J.20. Special variants such as the catapult version and the two-seater are also illustrated and described. The next 16 pages focus on modelling the 1/48 scale Classic Airframes RE 2000 kit. This section is supplemented with detail photographs of the real aircraft, plus colour pictures of preserved components. Maurizio's modelling skills are very impressive, and he supports this chapter with in-progress shots as he improves and modifies Classic Airframes' RE 2000. His finished model is inspirational. The remainder of the book provides a chapter on RE 2000 colours, more colour walkaround photos; three-view drawings and six colour profiles. Text is bilingual - the full body text and captions are supplied in both English and Italian. Aviolibri's format is ideal for modellers. This new book provides a compact history, ample reference photographs plus specific hints and tips for building a 1/48 scale Falco all in a single title. Recommended to anybody planning to build the Classic Airframes RE 2000 Falco.